Spectacular View ...Best Location.... Upscale Unit ! Luxurious Studio accomodations with breath taking views! This spectacular condo with captivating ocean views awaits you. Spend endless hours comfortably seated on your private balcony enjoying the ocean views and tropical trade breezes that will touch your heart and relax your soul. This condo is perfectly positioned to maximize the easterly trade breezes and has spectacular views of a myriad of British Virgin Islands, Cays, and St. John, contrasting to the shimmering azure sea of the famed Sapphire Beach! Arguably one of the best locations; its waterfront locale in the St. Vincent Building is just steps away from the palm-fringed Sapphire Beach and Marina; making your activities literally at your doorstep. Sapphire Beach has white sands and coral reefs offering some of the best snorkeling and sea turtle observation on Island. Sapphire Marina provides day excursion to St John, Yost Van Dyke, Virgin Gorda for sightseeing, snorkeling and Scuba. There are also fishing vessels available for charter! waters! The Euro bed can be folded away for added space for your morning yoga, but the condo is spacious and there is plenty of room to leave the bed down during your stay. The full size sofa also offers a queen bed for independent sleeping. Cleanse in this spacious, clean and bright modern tiled bathroom with walk-in shower. Enjoy the luxurious Gilchrist & Soames- TempleSpa body soaps and lotions to enhance your spa like experience. Enjoy preparing meals and drinks in this well equipped and stylishly appointed kitchen with trendy grey custom cabinetry, accented by sparkling white quartz surfaces. Keep connected with complimentary dedicated Wi-Fi Service. When you are not at the beach enjoy a refreshing swim in one of our community's two fresh water pools or dinner and drinks at the Slice; the trendy new restaurant poolside. 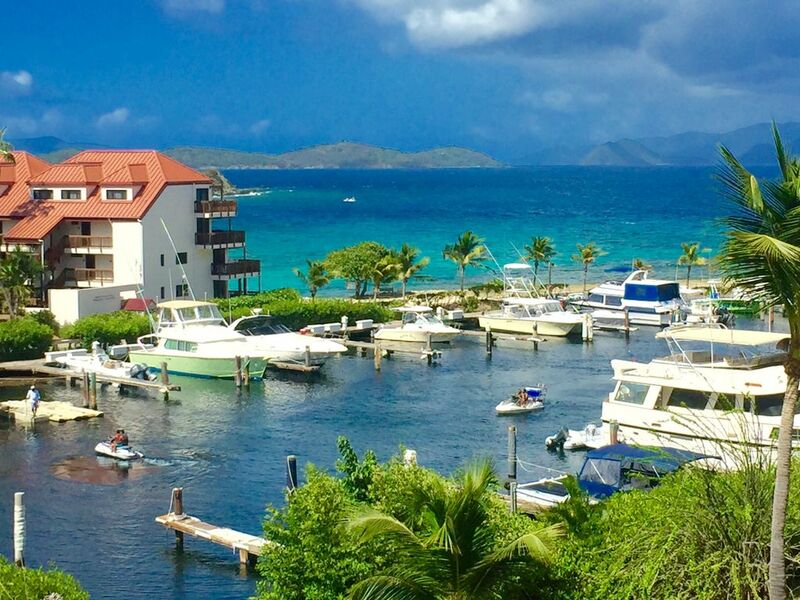 You will enjoy the convenience of being located only a 1/2 mile from American Yacht Harbor and the Village of Red Hook where you can shop, dine, enjoy cocktails or hop on the ferryboat for a short ride over to the Island of St. John. While on St. John, explore the shops and dining in Cruz Bay town or explore the U.S. National Park and beaches on its North Shore as well as the famed beaches of Trunk Bay, Cinnamon Bay, or Hawksnest beaches, Swim with the sea turtles at Maho Bay. Our condo is well maintained, affordable, clean and loved by all who visit. It's privately positioned for quiet enjoyment with complimentary parking during your stay. Your linens and cleaning fees are also included making this one of the best values! Give us a try.... Why take a chance with other questionable rentals when you can book with an experienced vacation home owner who has exceeded guest expectations for over 20 years. Want a little adventure? Try a Ziplining through the tropical rainforest canopy of Tree Limin, or rent jet skis at Sapphire Beach Marina. There is so much to see and do or simply kick back and relax in the Caribbean sunshine! Hello my name is Bill Sands. I have owned vacation rentals on St Thomas for over 20 years and have helped many guest make memories that will last a lifetime! Many of our guests have come back year after year and have become good friends. This property I own with my sister Ann ( pictured) r, her husband, and my partner. We are honored to have the badge of a VRBO- HomeAway Premier Partner! We are personally dedicated to your travel experience being the best that it can be! We recently our condo, so its the ultimate in style and comfort. Come experience Sapphire Beach! We purchased this unit because its arguably one of the best locations you will find! What a view ! We are in the St. Vincent Building , which is waterfront with the marina, beach and ocean at your doorsteps. Other units may look appealing, but trust me there is a big difference in the views and location and sizes . I am a real estate broker with over 30 years experience and 20 years of vacation home hospitality rental business. This unit is a personally owned and cherished by us. We understand you have many choices in where you stay, but give us a chance to impress you! Completely upgraded with stylish appointments ! Best location at Sapphire Beach and Marina locale. You are only a 1/2 mile from Red Hook ! Unit fronts on Marina with beach adjacent. Beach and activities just a short walk. Gorgeous ocean and down Island views of British Virgin Islands and St John! dedicated free Wi-Fi is inlcuded! spacious living room area with full size designer Coastal Chic Slipcover Rowe sofa ( sleeper) and two ultra comfortable chairs. Full array of current DVDs available at condo office - complimentary use! Spacious Ocean view Balcony Enjoy the view of the boats too! We found the previous reviews very accurate and helpful. Bill was accessible and communicative throughout our stay. The condo was the perfect location and well equiped/laid out for an unforgettable romantic get away. I would highly recommend staying at Bill’s place, given its proximity to all of the best aspects of Saint Thomas and very nice nearby beaches and restaurants. We strongly recommend bringing snorkeling gear and also paging through the guest book for helpful tips. Thanks so much Bill! Thank you for staying with us. We are so happy you enjoyed your vacation and stay with us. The location is really hard to beat! Simply the best location. Your unit faces eastwardly to take in one of the most gorgeous views you will find anywhere. You are a very short walk within the community to Sapphire Beach which offers some of the best snorkeling on Island. It's a great beach to explore and sunbathe. You are adjacent to the Sapphire Marina for a sunset sail, or jet skiing! Best of all you are only a 1/2 mile from Red Hook where you will find dozens of great restaurants, bars, shopping and groceries. The ferry boat terminal is also located in Red Hook for your excursion over to St John for restaurants, shopping or exploring the US National Park. St John is only a 30 minute ride over to Cruz Bay St John. It's most enjoyable to ride the ferry over for dinner and gaze at the stars on your journey back to St Thomas!